Summary: Tensorflow (TF) is Google’s attempt to put the power of Deep Learning into the hands of developers around the world. It comes with a beginner & an advanced tutorial, as well as a course on Udacity. However, the materials attempt to introduce both ML and TF concurrently to solve a multi-feature problem — character recognition, which albeit interesting, unnecessarily convolutes understanding. 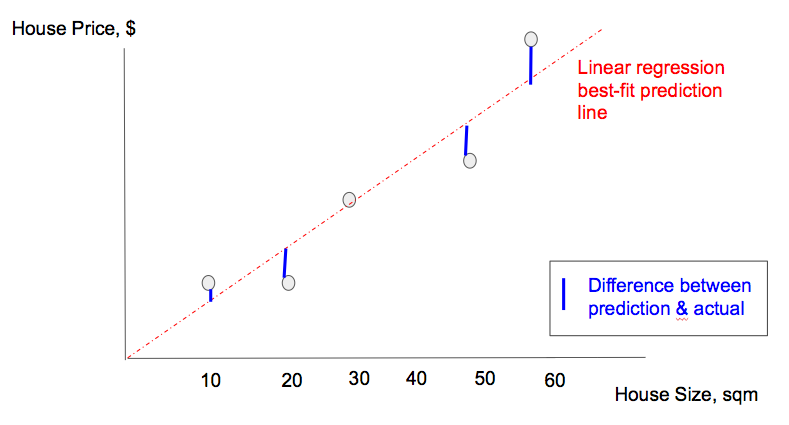 In this series of articles, we present the gentlest introduction to TF that starts off by showing how to do linear regression for a single feature problem, and expand from there. Placeholder: Represent an entry point for us to feed actual data values into the model when performing gradient descent, i.e., the house sizes (x), and the house prices (y_). Variable: Represent a variable that we are trying to find ‘good’ values that minimizes the cost function, e.g., W, and b. 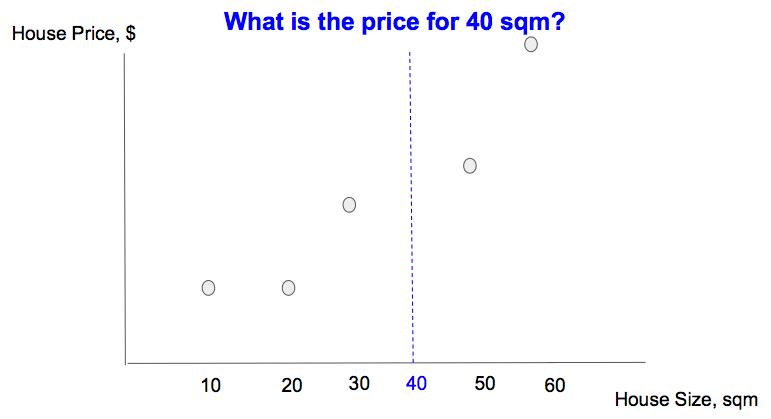 Similarly to feed actual house prices (y_) of the data points into the model, we create a placeholder. 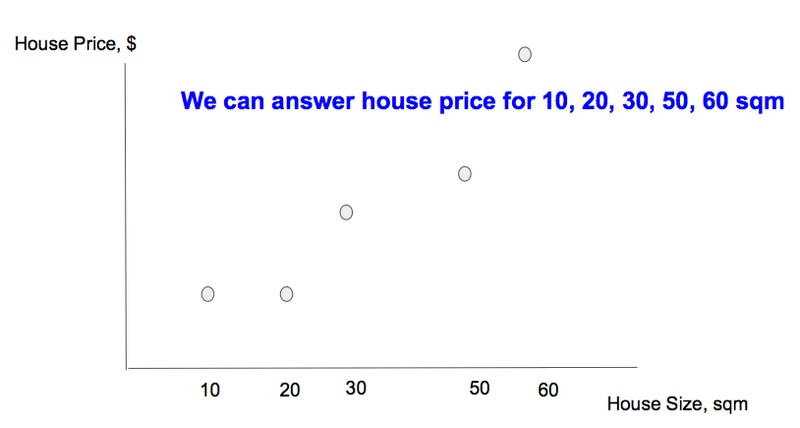 Since we do not have actual data points for house price (y_), house size (x), we generate them. 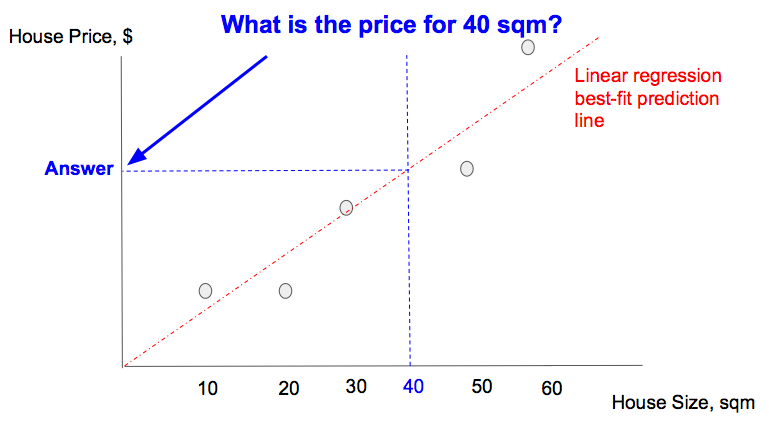 We set the house price (ys) to always be 2 times the house size (xs) for simplicity. 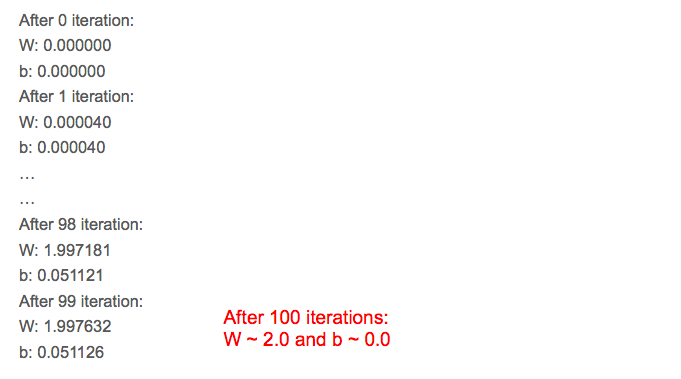 With the linear model, cost function, and data, we can start performing gradient descent to minimize the cost function, to obtain the ‘good’ values for W, b. The 0.00001 is the size of the ‘step’ we take in the direction of steepest gradient each time perform a training step; this is also called learning rate. Training involves performing gradient descent a pre-determined number of times or until the cost is below a pre-determined threshold. All variables needs to be initialize at the start of training otherwise they may hold remnant values from previous execution. Although TF is a python library, and python is an interpreted language, TF operations, by default are NOT interpreted for performance reasons. Thus the init above is NOT executed. Instead TF executes within a session; create a session (sess) and then execute stuff using sess.run(). 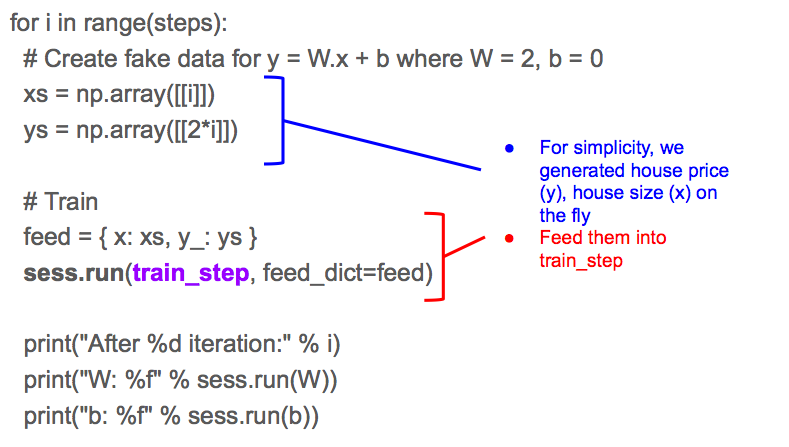 Similarly we execute the train_step above within a loop by calling it within sess.run(). At the bottom of the dependencies are the placeholders x, y_; and as we learned earlier tf.placeholders are used to indicate where we will feed actual data point values house price (y_), and house size (x). The print statement in the loop will show how TF learn the ‘good’ values for W, and b over each iteration. We have learned about Machine Learning in its simplest form; predict an outcome from a single feature. We chose a linear model (for simplicity) to fit our data points, define a cost function to represent best-fit, and train our model by repeatedly tweaking its gradient variable, W, and position variable b to minimize the cost function.